LOCATION.--Lat 42°38'00", long 73°48'20" referenced to North American Datum of 1983, Albany County, NY, Hydrologic Unit 02020006, on left bank 0.35 mi upstream from bridge on Normans Kill Road at Normansville, and 0.40 mi upstream from Delaware Avenue bridge, in Albany. PERIOD OF RECORD.--Occasional low-flow and/or miscellaneous discharge measurements, water years 1949, 1952, 1954, 1959, 1962-65, 1985. Annual maximum only--1984, 1992-2012, 2014-15. May 1979 to April 1983, July 2012 to February 2014, May 2015 to current year. GAGE.--Water-stage recorder and crest-stage gage. Datum of gage is 86.48 ft above NGVD of 1929. REMARKS.--Water Years 2014-16: Records good except those for estimated daily discharges, which are fair. 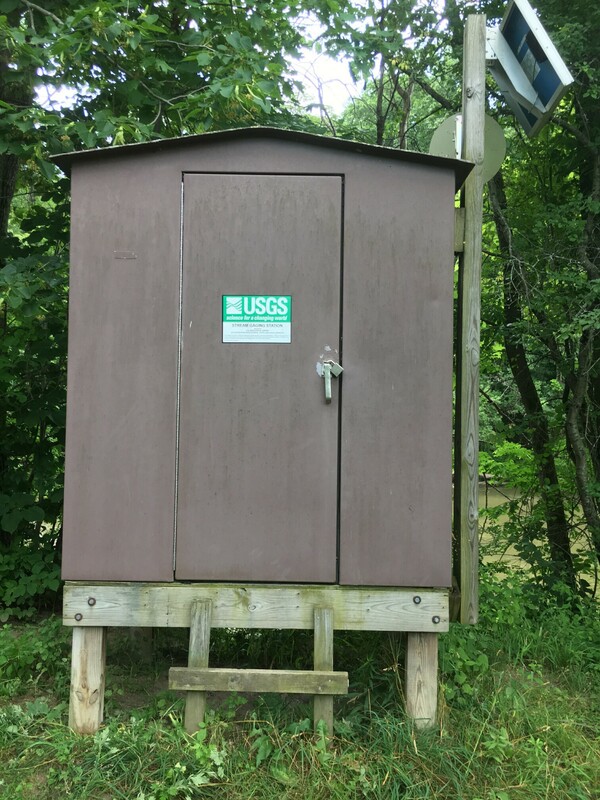 EXTREMES FOR PERIOD OF RECORD.--Maximum discharge, 13,200 ft³/s, Aug. 28, 2011, gage height, 14.15 ft; minimum discharge, 9.1 ft³/s, July 23, 2016; minimum gage height, 2.71 ft, Sept. 8, 2016. PERIOD OF DAILY RECORD1.--SUSPENDED-SEDIMENT DISCHARGE: August to September 2011, July 2012 to February 2014 (discontinued). REMARKS1.--Turbidity data are collected every 5 minutes (15 minutes during the 2012 water year) using an in situ turbidity probe located about 1,500 ft downstream. Beginning in the 2012 water year, daily suspended load and concentration derived from a regression equation relating turbidity and streamflow to suspended-sediment concentration. EXTREMES FOR PERIOD OF DAILY RECORD1.--SUSPENDED-SEDIMENT CONCENTRATION: Maximum daily mean, 2,280 mg/L, Aug. 28, 2011; minimum daily mean, 2 mg/L, July 19, 20, 22, 2012. SUSPENDED-SEDIMENT DISCHARGE: Maximum daily, about 42,300 tons, Aug. 28, 2011; minimum daily, 0.17 tons, Sept. 16, 17, 2012.